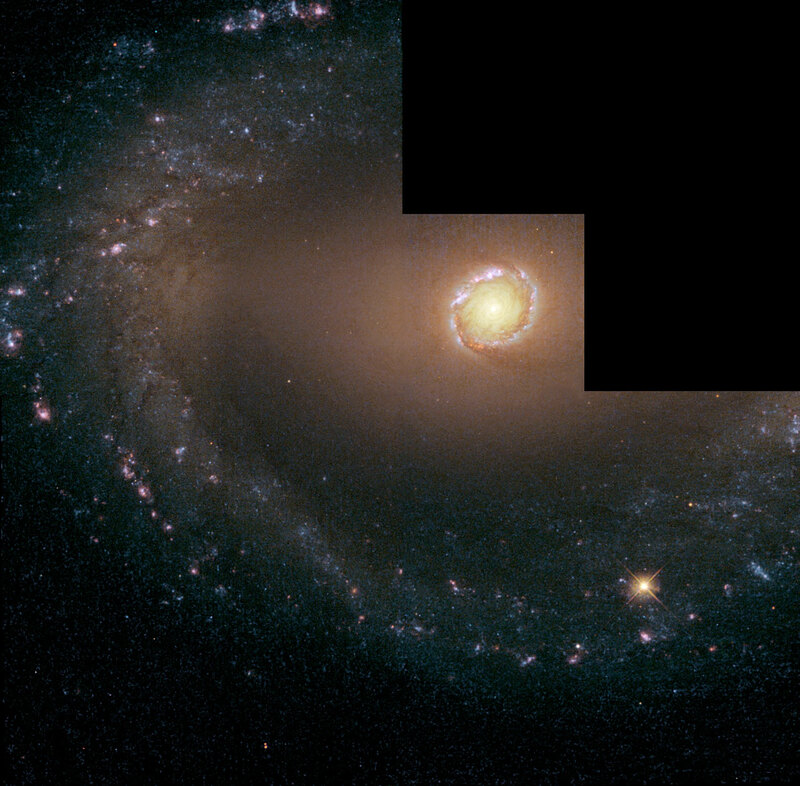 An extensive, multi-wavelength study with the Hubble Space Telescope has shown the many faces of the galaxy NGC 1512. 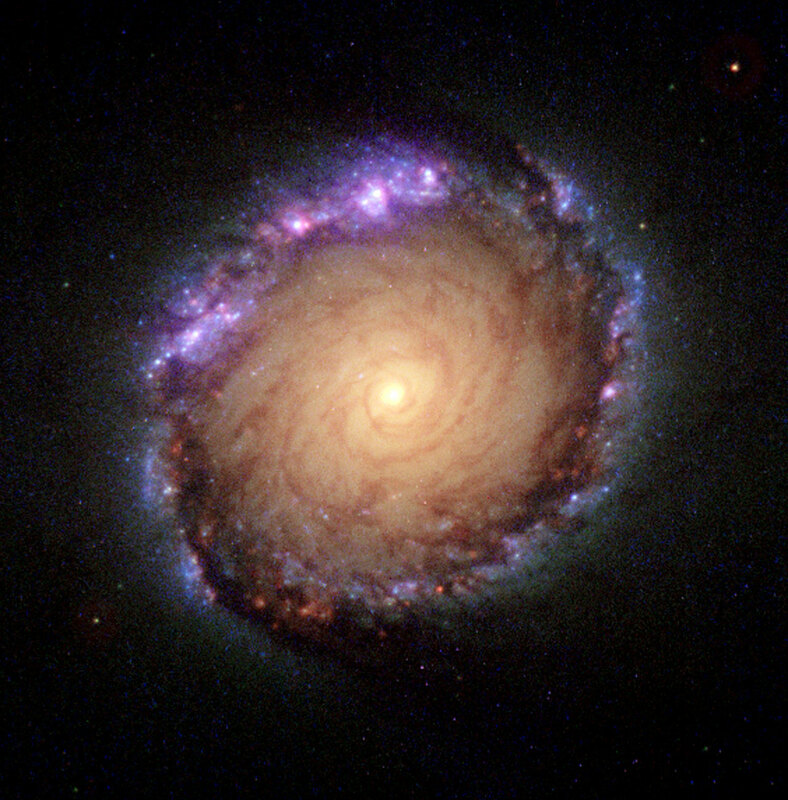 Hubble's unique vantage point high above the atmosphere allows scientists to see objects over a broad range of wavelengths from the ultraviolet to the infrared. In this view of the centre of the magnificent barred spiral galaxy NGC 1512, the NASA/ESA Hubble Space Telescope's broad spectral vision reveals the galaxy at all wavelengths from ultraviolet through to infrared. 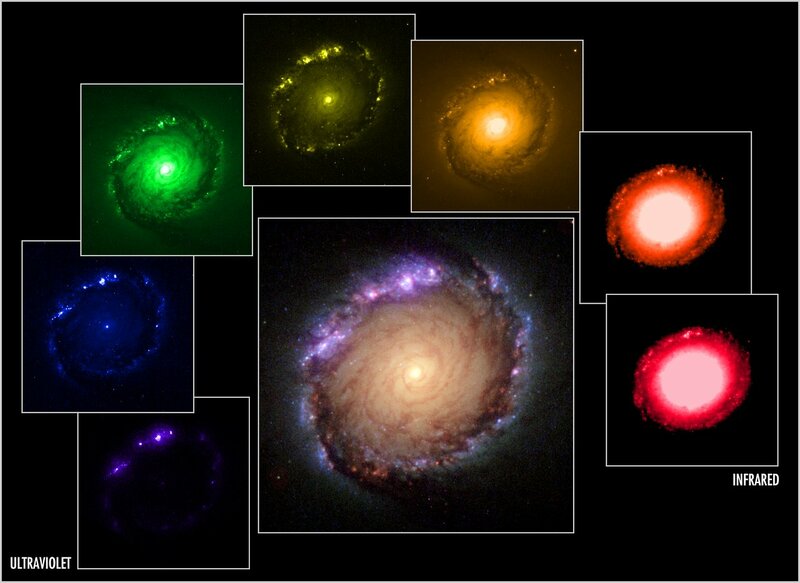 The colours (which indicate differences in light intensity) map where newly born star clusters exist in both 'dusty' and 'clean' regions of the galaxy. 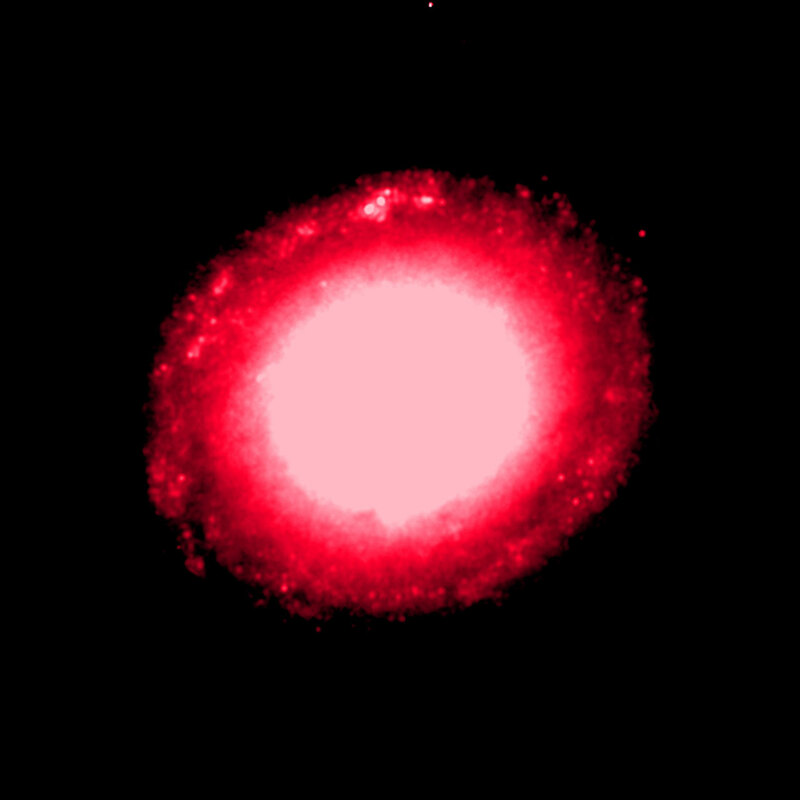 This colour composite image was created from seven images, taken with three different Hubble cameras, the Faint Object Camera (FOC), the Wide Field and Planetary Camera 2 (WFPC2) and the Near Infrared Camera and Multi-Object Spectrometer (NICMOS). NGC 1512 is a barred spiral galaxy in the southern constellation of Horologium. 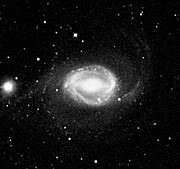 Located 30 million light years away, relatively 'nearby' as galaxies go, it is bright enough to be seen with amateur telescopes. 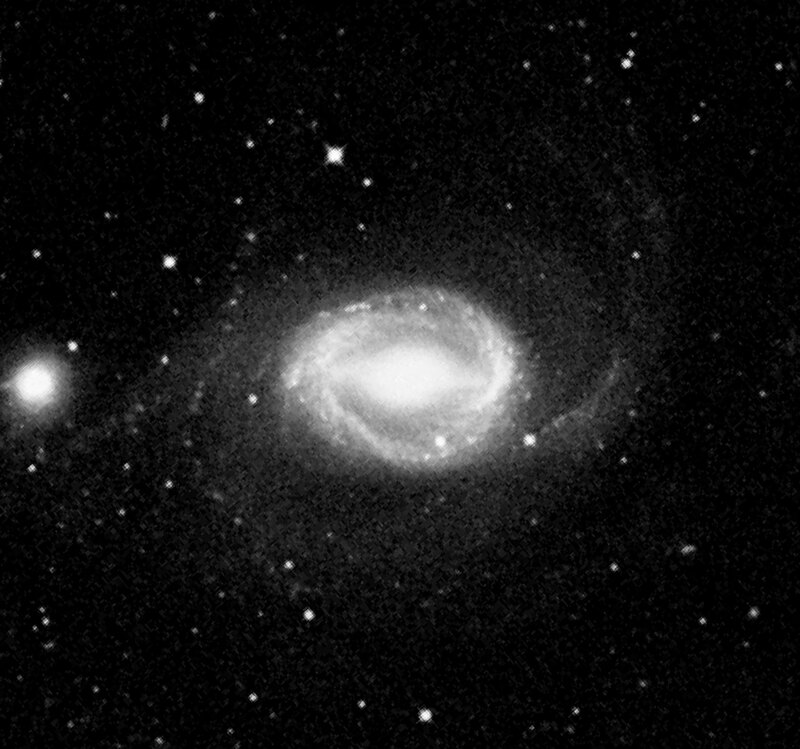 The galaxy spans 70 000 light years, nearly as much as our own Milky Way galaxy. 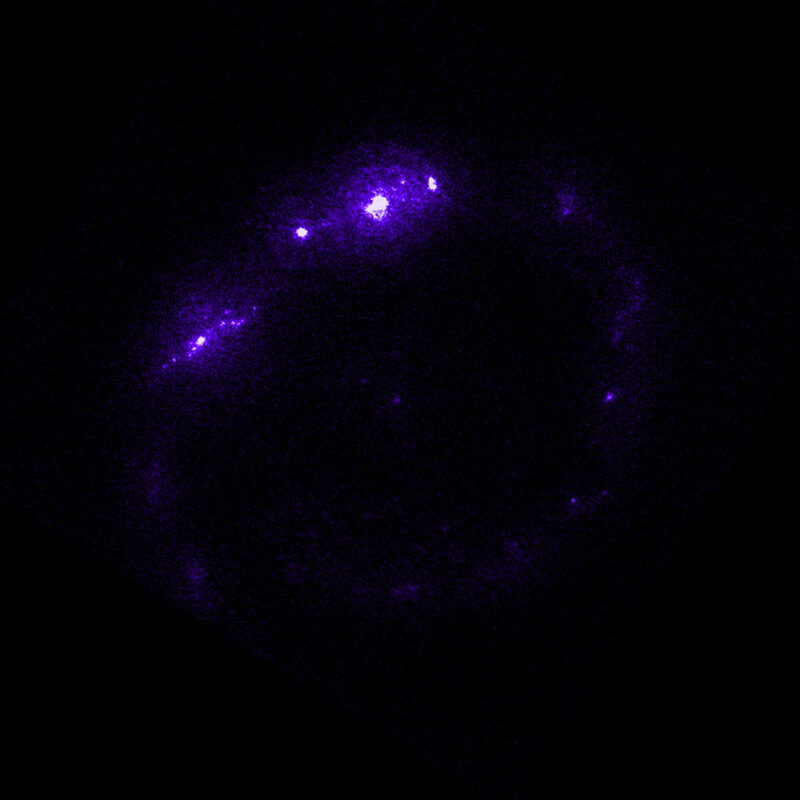 The galaxy's core is unique for its stunning 2400 light year wide circle of infant star clusters, called a 'circumnuclear' starburst ring. Starbursts are episodes of vigorous formation of new stars and are found in a variety of galaxy environments. 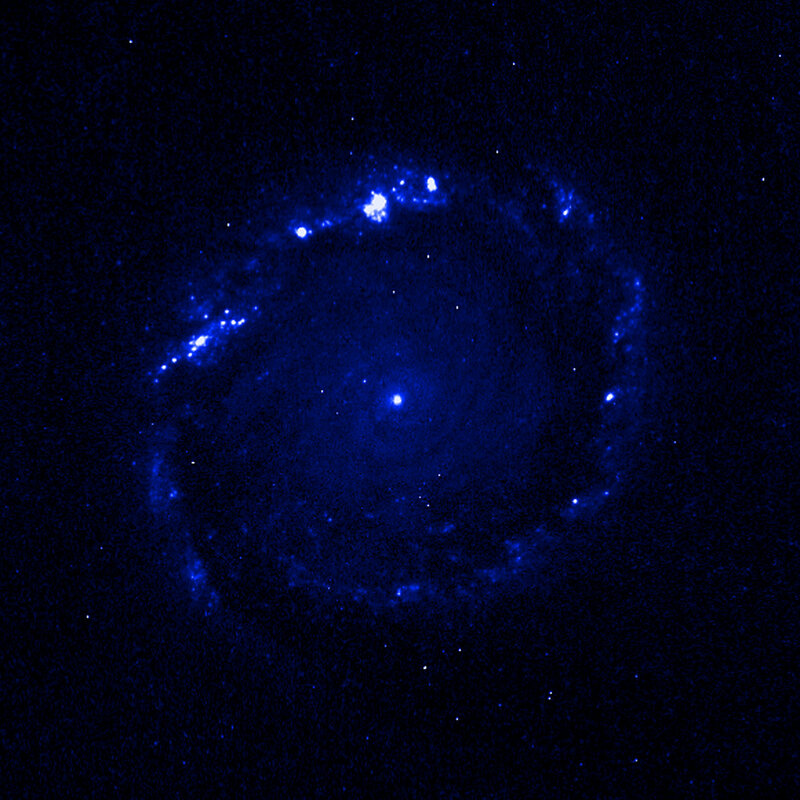 Taking advantage of Hubble's sharp vision, as well as its unique wavelength coverage, a team of Israeli and American astronomers performed one of the broadest and most detailed studies ever of such star-forming regions. 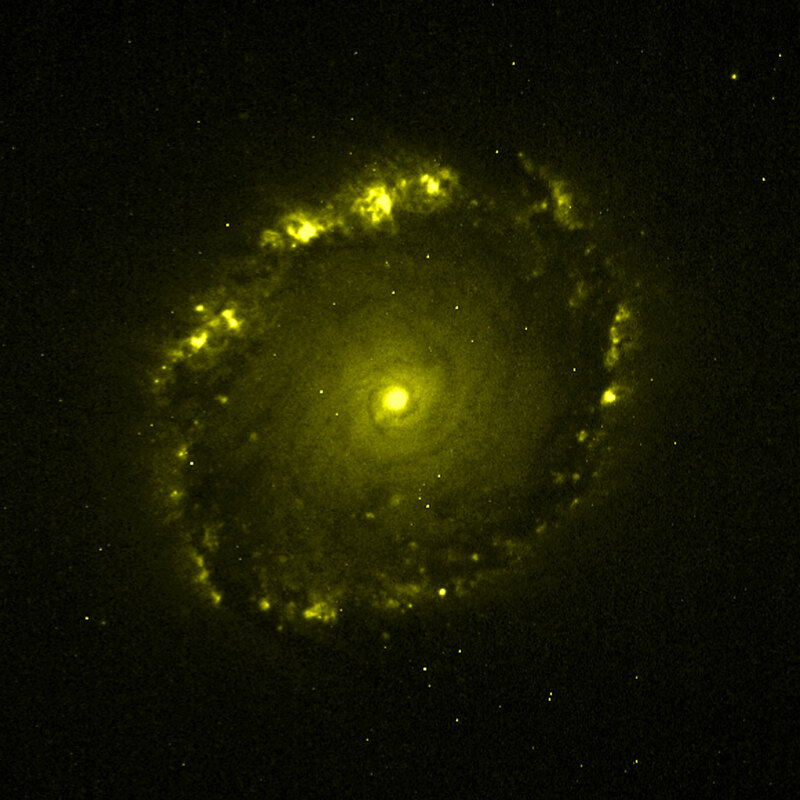 The results, which will be published in the June issue of the Astronomical Journal, show that in NGC 1512 newly born star clusters exist in both dusty and clean environments. 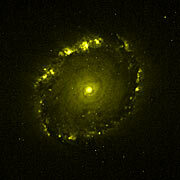 The clean clusters are readily seen in ultraviolet and visible light, appearing as bright, blue clumps in the image. However the dusty clusters are revealed only by the glow of the gas clouds in which they are hidden, as detected in red and infrared wavelengths by the Hubble cameras. This glow can be seen as red light permeating the dark, dusty lanes in the ring. 'The dust obscuration of clusters appears to be an on-off phenomenon' says Dan Maoz, who headed the collaboration. 'The clusters are either completely hidden, enshrouded in their birth clouds, or almost completely exposed.' The scientists believe that stellar winds and powerful radiation from the bright, newly born stars have cleared away the original natal dust cloud in a fast and efficient 'cleansing' process. 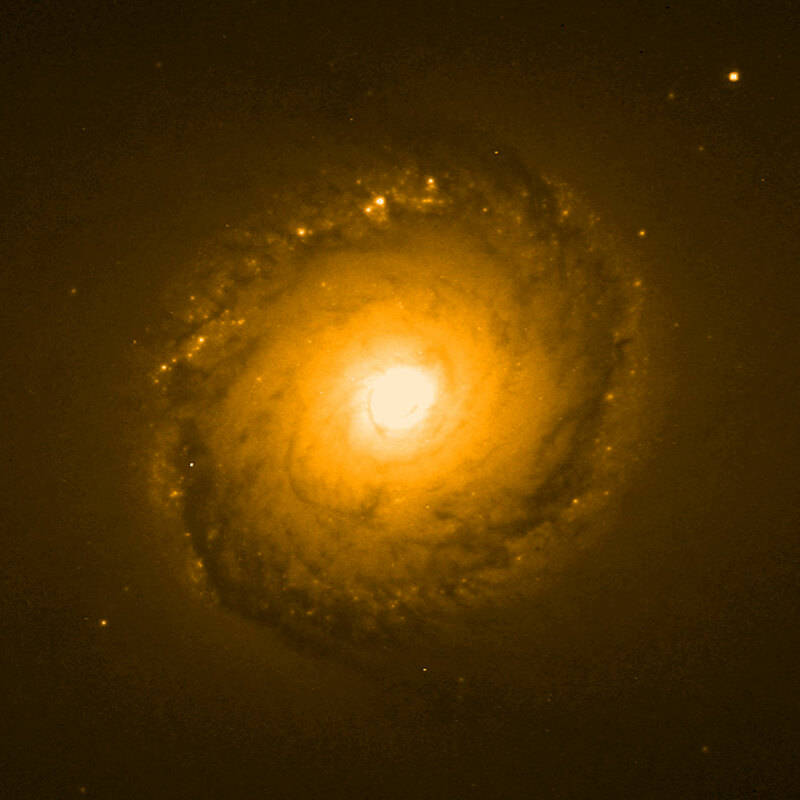 Aaron Barth, a co-investigator on the team, adds: 'It is remarkable how similar the properties of this starburst are to those of other nearby starbursts that have been studied in detail with Hubble.' 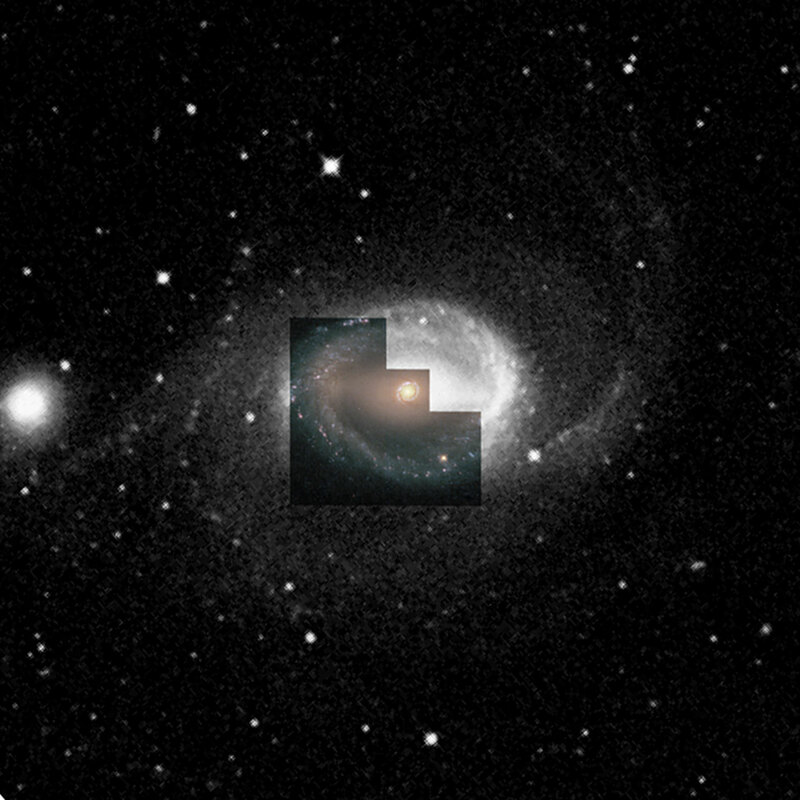 This similarity gives the astronomers the hope that, by understanding the processes occurring in nearby galaxies, they can better interpret observations of very distant and faint starburst galaxies. 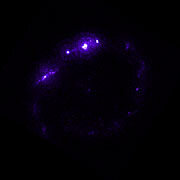 Such distant galaxies formed the first generations of stars, when the Universe was a fraction of its current age. Circumstellar star-forming rings are common in the Universe. Such rings within barred spiral galaxies may in fact comprise the most numerous class of nearby starburst regions. 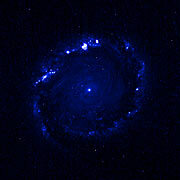 Astronomers generally believe that the giant bar funnels the gas to the inner ring, where massive stars are formed within numerous star clusters. Studies like this one emphasise the need to observe at many different wavelengths to get the full picture of the processes taking place. 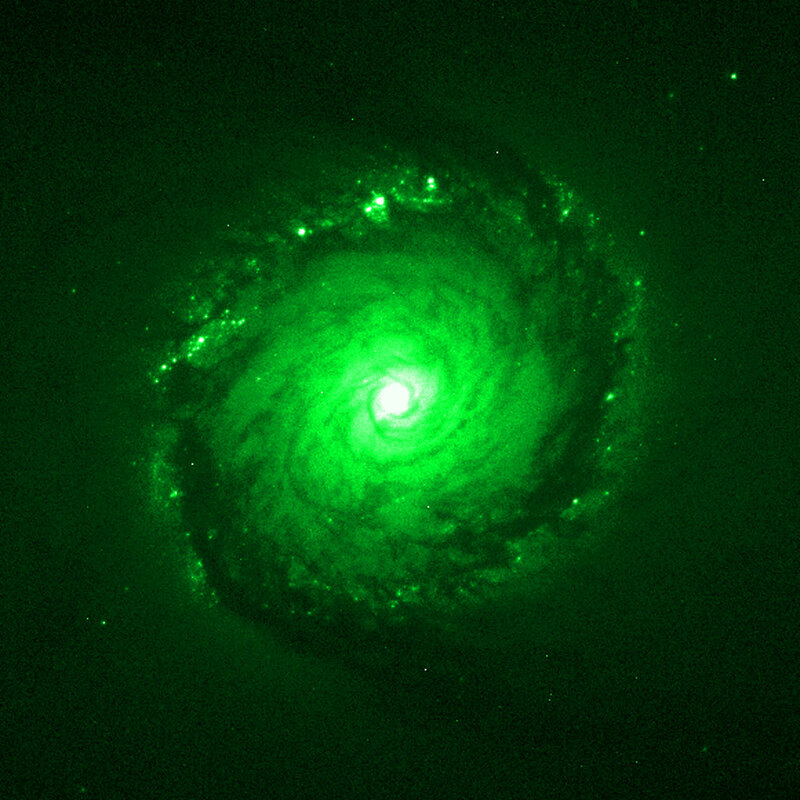 This news release is issued jointly by ESA (Hubble European Space Agency Information Centre) and NASA (Office of Public Outreach). 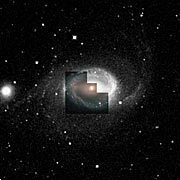 Members of the group of scientists involved in these observations are: Dan Maoz (Tel-Aviv University, Israel and Columbia University, USA), Aaron J. Barth (Harvard-Smithsonian Center for Astrophysics, USA), Luis C. Ho (The Observatories of the Carnegie Institution of Washington, USA), Amiel Sternberg (Tel-Aviv University, Israel) and Alexei V. Filippenko (University of California, Berkeley, USA).